Steelhead fishing series - Vancouver Island, a Steelhead Angler's Paradise! "Vancouver Island, a Steelhead Angler's Paradise!" 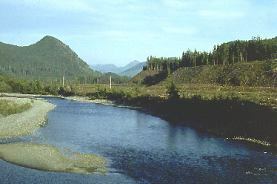 The Nimpkish river is the largest river on Vancouver Island. Wild steelhead 12 months of the year; over 200 rivers from which to choose, all within a day's drive of any location on the Island; urban hatchery streams that now produce large numbers of steelhead; powerful fish that can weigh up to 20 pounds and more; only on Vancouver Island is it possible to have such a selection of steelheading choices. Here, there are countless opportunities in a moderate coastal climate which offers steelheaders angling quality and quantity every day of the year! This steelheader's utopia, Vancouver Island, rests about 20 miles from the British Columbia coast and stretches 280 miles in a northwest direction. It is about 60 miles wide with a spine of rugged mountains, the Vancouver Island Mountain Range, which often reaches a mile or more skyward. It is carved by rugged Pacific ocean fjords and inlets and punctuated with over 2000 fish bearing lakes. Over 200 rivers and streams and uncountable creeks provide a veined network of steelhead nursery watersheds and valleys throughout Vancouver Island, draining to the Pacific ocean and the rich marine bounty where steelhead grow and thrive. Anglers play a steelhead in the Little Qualicum river. Vancouver Island offers two distinct races of steelhead, summer run steelhead and winter run steelhead. Most Island river have runs of winter steelhead. These trophy rainbow trout enter rivers in December through April. Summer steelhead runs populate most west coast rivers but exist in only a few east coast rivers like the Campbell , the White and the Tsitika. Steelhead sizes range from 4 to 30 pounds with the average being 8 pounds. 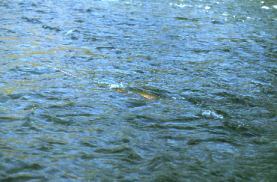 About 5000 resident anglers and another approximate 5000 visiting steelheaders annually catch about 35,000 steelhead. A healthy hatchery program has increased steelhead catches in recent years and provided a quality steelhead fishery in a few select rivers like the Somass, Stamp, Quinsam and Quatse. Most streams however are populated with wild steelhead only. Regular steelhead swim counts by the provincial Fish & Wildlife Branch keep current details on numbers of fish. For the visiting steelheader it is advisable to contact the Vancouver Island Fisheries Branch at (250) 751-3100 prior to fishing to obtain details of these counts and regulations for individual rivers. The upper waters of the Salmon river are now being populated with steelhead fry in a major hatchery renewal program. During past years the highest producing Vancouver Island steelhead streams usually include the following rivers; Stamp, Somass, Quinsam, Quatse, Cowichan , and the Gold . It is of interest that the Gold is managed as a non-hatchery 'catch-and-release' stream and usually produces a catch of 5000 wild steelhead annually. Faced with such a plethora of choices, the most difficult decisions required by the steelheader visiting Vancouver Island are: "What rivers do I wish to fish?" "What method of angling would I prefer?" and, "When do I wish to visit?" Vancouver Island has a population of about 650,000 people who live in vastly diverging lands. Victoria on the southern tip is a modern city of 350,000 with all the amenities including world class visitor requirements. It is also the capital city of British Columbia. From this bustling metropolis of Victoria to the fishing, mining, and logging community of Port Hardy in the far north of the Island, lies a number of cities, towns and villages almost all situated on the coastline and, all rich with sports fishing opportunity and tradition. Each community has well organized current sources of information for the visiting angler coordinated by Tourism Vancouver Island. Vancouver Island is divided into six major tourism regions. These include the South Island, the South Central Island, Central Island, North Central Island, and the North Island including mainland inlets up to Rivers Inlet. The South Island Region is situated on an extensive flat peninsula and has few rivers because it is away from the watersheds of the Vancouver Island Mountain Range. However, access is available to South Island and South West Island areas where rivers like the Sooke, Gordon and Harris creek provide quality steelheading opportunities. 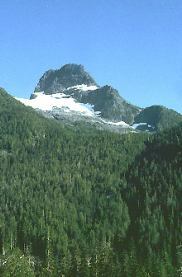 Victoria Peak, Vancouver Island's second largest mountain at 7200 feet is the headwaters of the White river, a fabled summer steelhead stream. The South Central Island Region, about one hour's scenic drive from Victoria over the Malahat summit, is centered in the Cowichan Valley. Here, through the city of Duncan , flows the world famous Cowichan river. It is a beautiful and bountiful river with excellent stocks of steelhead and brown trout. These are available throughout the year for the wading or boat drifting river angler. The provincial Vancouver Island Hatchery, (250) 746-1425 , responsible for rearing and stocking most Vancouver Island rivers and lakes, is situated in Duncan. The Central Island Region lies on the east coast around the 'Harbour' city of Nanaimo . 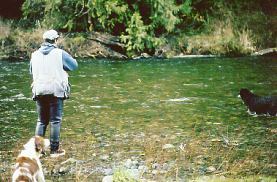 Numerous nearby rivers like the Chemainus, Nanaimo, Little Qualicum, Englishman and Big Qualicum were very popular for winter steelhead fishing. However, in the last few years there has been a dramatic decline in winter steelhead returning to east coast rivers for reasons unknown. Angling closures have been imposed to protect the few fish that do return. Check with the Fish & Wildlife office to obtain current regulations and fish stock status. The West Coast Region provides an incredible smorgasbord of angling opportunities. At the head of the Alberni Inlet flows the rich Somass river with its major tributaries, the Stamp and the Sproat rivers. The Stamp river is an all year steelhead stream with large runs of summer and winter steelhead. Over 50% of all steelhead caught on Vancouver Island come from the Stamp-Somass rivers. The North Central Island Region covers a vast area of Vancouver Island and centres around the communities of the Comox Valley , Campbell River and Gold River . The Campbell River is the 'home' river of angling scribe Roderick Haig-Brown and forms the core for many of his world famous writings on steelhead and salmon angling. 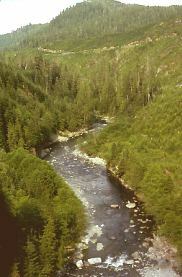 Other popular steelheading rivers in this region include the Quinsam, Heber, Bear and Salmon. The Salmon is know to provide large winter steelhead and is truly the unknown sleeper of Vancouver Island streams. In this region it is possible to have successful steelheading every single day of the year. The rainbow hue of a fighting Vancouver Island steelhead tells of the rainbow trout ancestry of these trophy fish. The North Island Region, including Queen Charlotte Strait inlets on the mainland of British Columbia, is an area of deep contrast. Remote fishing lodges, small logging, mining, and fishing communities all provide centres for outstanding fishing opportunities. Fishing is a way of life for these communities, whether it be commercial or sport, saltwater or freshwater. This is the frontier of Vancouver Island, rugged and beautiful. Steelheading rivers in this area includes the largest river on Vancouver Island, the Nimpkish, and other streams like the Cluxewe, Keough, Quatse, and Nahwitti, and numerous smaller streams. "Tight Lines, Silver Smiles and Good Fishing!"